Mucosal barrier defects lead to abnormal intestinal permeability which may underlie the pathogenesis of inflammatory bowel diseases. Endoscopic confocal laser endomicroscopy (eCLE) integrates a confocal laser microscope into the tip of a video colonoscope to permit 1,000-fold optical magnification to allow real-time in vivo histological assessment of the mucosa. Dynamic imaging is therefore possible using eCLE and can identify the intestinal permeability features of “cell-junction enhancement,” “fluorescein leak,” and “cell dropout” following intravenous injection of fluorescein. These features differ to typical histopathology and macroscopic endoscopy and their learning characteristics have not been previously described. Figure 1. 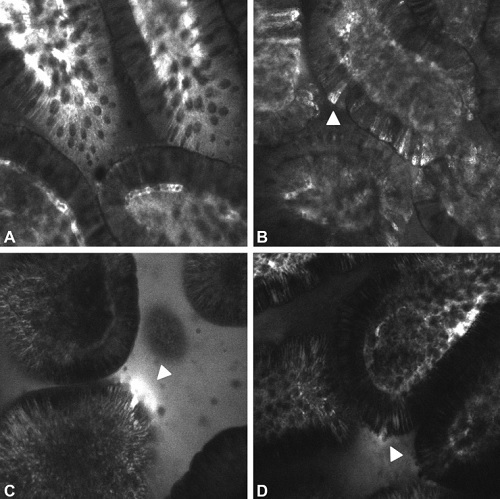 Endoscopic confocal laser endomicroscopic features of increased intestinal permeability. Control (A), cell-junction enhancement (B), fluorescein leak (C), cell dropout (D). Several studies had already demonstrated the capability of eCLE and pCLE in the detection of increased intestinal permeability. However, the learning characteristics of these dynamic features have not been described previously. Pathologists are trained in the recognition of static histopathology and may not have any advantage in the learning of the dynamic features of intestinal permeability. 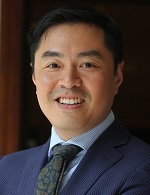 It was, therefore, important to describe the diagnostic accuracy, inter- and intraobserver agreement and learning curve for the correct interpretation of eCLE images of intestinal permeability in experienced eCLE analysts (gold standard Group A), those without any prior eCLE training (Group B), and in qualified pathologists (Group C). Confocal laser endomicroscopy dynamic features of intestinal permeability are relatively easy to learn. After 60-90 eCLE training images the diagnostic accuracies of Groups B (89%) and C (90%) significantly improved and approached that of gold standard Group A (95%). There was no significant difference between the diagnostic accuracies of Group B with Group C, indicating prior pathology training did not influence the interpretation of eCLE dynamic features. Overall inter-observer agreement was high (kappa = 0.83) for experienced eCLE analysts and highest for “fluorescein leak” (kappa 0.92) followed by “cell junction enhancement” (0.85) and “cell dropout’ (0.80). Intra-observer agreement remained high on repeat testing after 6 months (kappa 0.86 to 0.99). Being confident (OR: 8.7, 95% CI: 5.6-13.6) and good image quality (OR: 1.6, 95% CI: 1.2-2.0) were significant predictors of accurate interpretation. Figure 2. 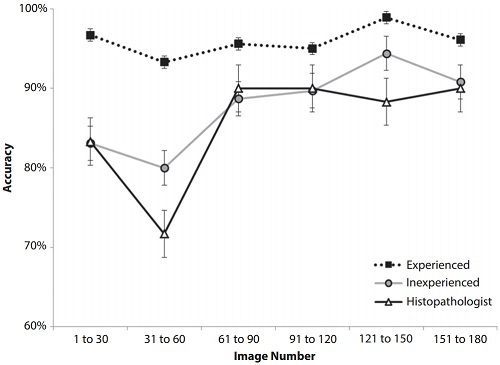 Learning curve as represented by diagnostic accuracy (percentage and 95% confidence interval) in experienced analysis (black squares), inexperienced analysts (gray circles), and pathologists (open triangles) at the end of each set. Dynamic features of intestinal permeability can be identified using eCLE and are relatively easy to learn after exposure to 60 to 90 training images. Inter- and intra-observer agreement kappa scores were high indicating reliability of these features. Being confident and ensuring high image quality images are used also predicts for high diagnostic accuracy. Endoscopists may learn these features without any prior training in pathology.